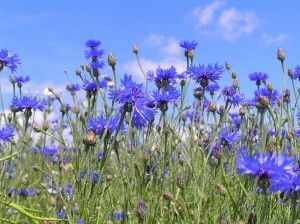 Bright and cheerful, the bright blue of the knapweed or cornflower is pretty among the rolling green hills of Germany. The state flower of Germany is the cornflower, locally called the knapweed, and with the distinction come a few interesting local traditions. In Germany, it is traditional to wear the cornflower in your lapel if you’re unmarried. The bright flowers are also iconic of the bright green hills and beauty of this European land. The bright blue cornflower has been a garden staple since ancient times. Native to Germany and many other countries in Europe, the cornflower was both beautiful and medicinal in the gardens. 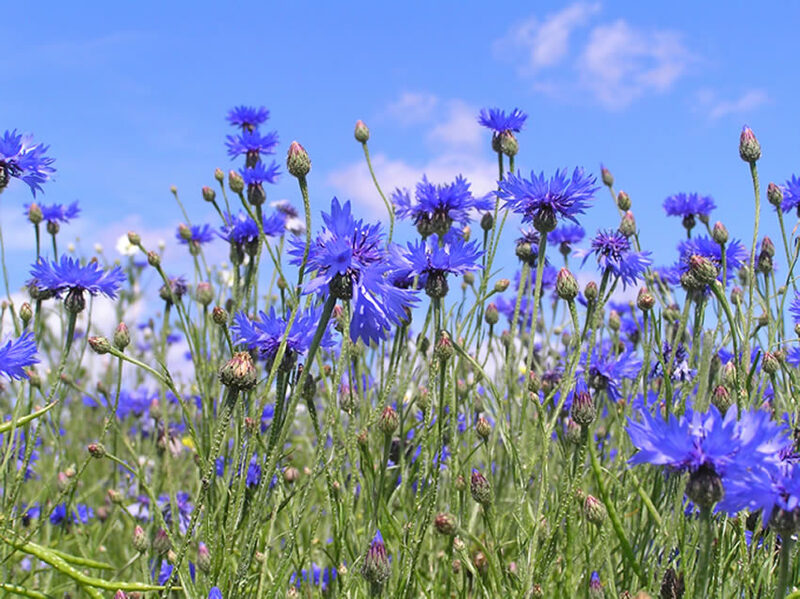 The color of the cornflower lead many to believe that it was healing for eye injuries, and today herbalist agree that a decoction of the leaves is useful as an eye lotion. Knapweed is a tough variety of cornflower, seen most often in the fields and meadows rather than flower beds or gardens. This tough variety of cornflower isn’t often found for sale to be used in gardens because it is a very hardy variety of flower that can dominate a flower bed. The plant is seen most often growing in the wild, and would be lovely in a prairie field where you’re growing wildflowers, but not as attractive in your flower beds. To grow other, gentler forms of cornflowers, start with seeds. The taller versions of cornflower are almost exclusively found as seeds rather than seedlings in garden centers. Plant the seeds in partial or full sun and water regularly. The annual varieties of cornflower will bloom very quickly. Some cornflower is available as a perennial, and this takes longer to become established and bloom. Cornflowers make beautiful cut flowers as part of floral arrangements as well as looking lovely in the garden. This entry was posted on Monday, January 31st, 2011 at 6:00 pm	and is filed under National Flowers. You can follow any responses to this entry through the RSS 2.0 feed. This is a thing I must find more information about, appreciation for the blog post.